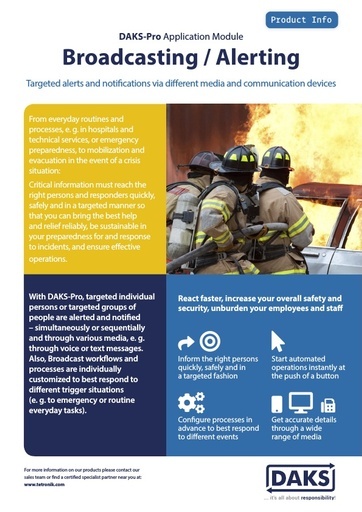 DAKS-Pro offers a wide-range of functions to optimize business processes, for alarms in combination with emergency calls and hazardous incidents, and to support efficient crisis communication in any heterogenous ICT environment. 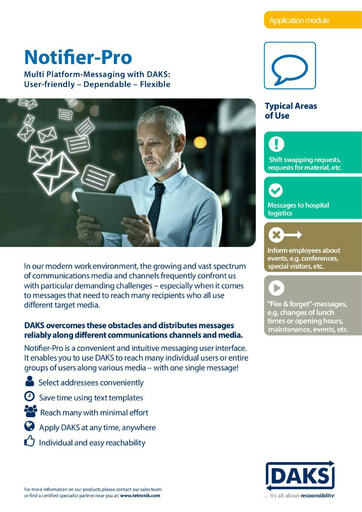 DAKS-Pro reliably automates and optimizes your business-critical communication - especially in emergency and crisis situations - and in virtually all industries. DAKS-Pro handles the widest variety of communications tasks with the help of different function modules, all of which are available for order, and applications that can be installed on a server in any combination and expanded with add-on functions, such as contacts, data interfaces, positioning functionalities, customized user interfaces and many more. To answer to your individual requirements, DAKS-Pro comes in two different performance categories - on the powerful DAKS-200 platform and on the modular expandable and even more high-performance DAKS-300 platform that meets even the most ambitious challenges. DAKS Module of the Month of October: Intelligent Calling - the "Cherry on the Cake"
In a wide range of operational areas, the ability to simultaneously or sequentially alert and notify individual persons or entire groups of people makes it possible to set up veritable security systems. It is in this field that DAKSpro operates either autonomously or in combination with host systems connected via certified interfaces to DAKSpro. Vital information is transmitted automatically, faster and more securely. This brings increased mobility to your employees and relieves them of error-prone, time-consuming and monotonous job routines. 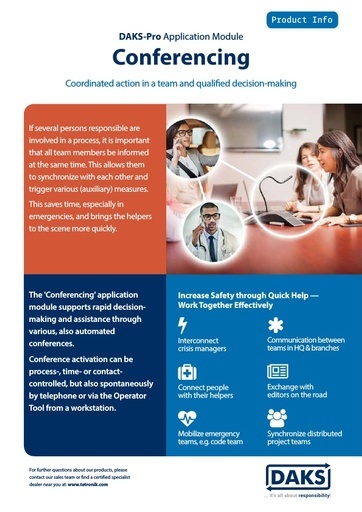 Use this powerful function module to convene and control Meet-me-, Preset-, Ad-hoc- and Progressive Conferences (especially for emergency conferencing) over the phone or through operators at monitor-based workstations. The user-friendly, intuitive and ad-hoc launch of telephone conferences accelerates your communications and decision-making processes substantially. ... and in many more areas. Staff in hazardous work areas can be monitored by the DAKS Server through cyclical calls or through cyclical verification of the data connection to their handsets. Whenever a monitored subscriber fails to report back or the data connection to a subscriber's handset is lost, the system will automatically activate a predefined alarm process. 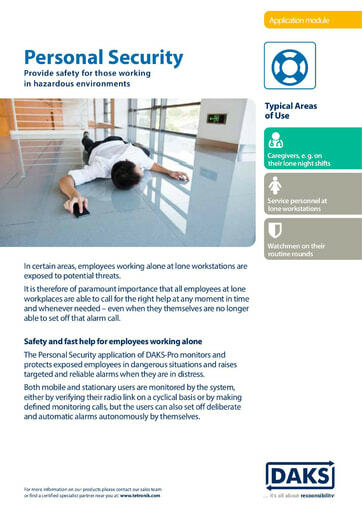 Also, DAKS transmits deliberate or automatic alarms triggered by alarm buttons or sensors of the particular mobile devices. To tweak the system to individual needs and requirements, DAKS manages throughout the entire system Personal Security parameters such as texts, announcements for user-guidance, wait times, keystroke confirmation, escalations etc. You need to be in compliance with the employers' liability insurance association? 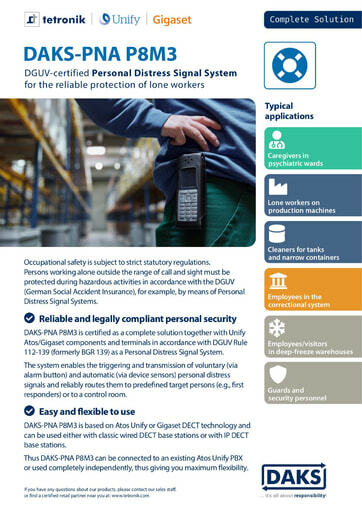 Please learn about our Personal Alarm System 'DAKS-PNA' – a solution in full conformity with the German DGUV-112-139. With the application module 'Info Telephone' DAKSpro becomes an intelligent multichannel announcement device. Using voice messages recorded on the fly, or also pre-recorded announcements, many callers can be informed at the same time. In a similar way, the server can be called from the outside to give access to a live broadcast, e.g. of an ongoing conference or other event. With Call Profiles, a single phone number is enough for the system to automatically call every other phone number of a person (= 'Personal Calls') or of the relevant members of an entire team (= 'Group Calls'), either in parallel or sequentially. During this process, callers are placed in a waiting position and get a ringback tone as well as wait music and/or voice messages. This puts an end to the tedious, time consuming and nerve-wracking search for the right person - especially when every second counts! 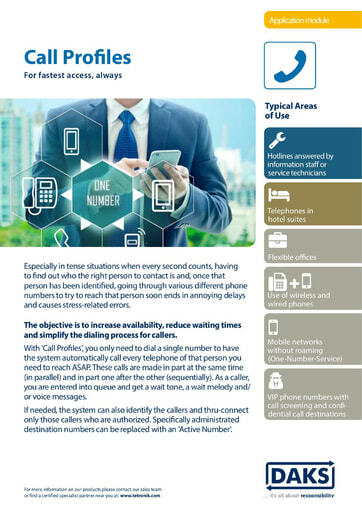 By internally assigning multiple communications devices (both stationary and mobile) to one user, this person can always be reached at the same number regardless where he/she may actually be at the moment (One-Number-Service). This significantly increases the accessibility of mobile subscribers and reduces the wait time for callers. By calling a single group number, all members of that team are automatically called in parallel and at the same time. The team member who answers first gets the call. Often, regulated duties have to be reorganized due to short-notice changes. For instance, employees can fall ill, have to fulfill other tasks or are temporarily available under a different number. According to those changes, call diversions have to be constantly adapted by an operator. This often results in errors and time lags during which service employees may not be available. The application 'Role-based Telephony' enables employees themselves to directly sign in, sign out or change the device they wish to be called on, using either their phone or a web-interface. 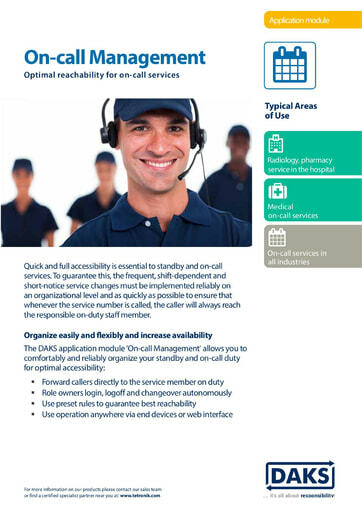 Also, rules and conditions can be predefined to keep the on-call service available at all times. In our modern work environment, the growing and vast spectrum of communications media and channels frequently confront us with particular demanding challenges – especially when it comes to messages that need to reach many recipients who all use different target media. DAKS overcomes these obstacles and distributes your messages reliably along different communications channels and media. Notifier-Pro is a convenient and intuitive messaging user interface. It enables you to use DAKS to reach many individual subscribers as well as entire groups of users along various media – with one single message! "fire and forget"-messages such as shift swapping requests, requests for material, etc. 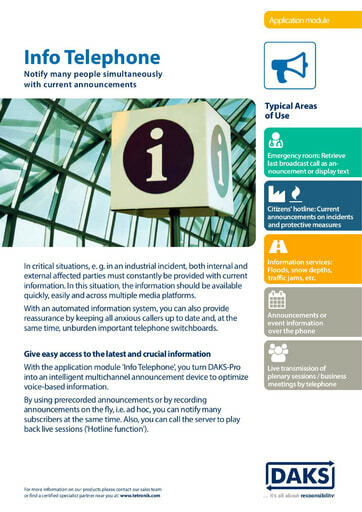 Inform employees / departments about events, e.g. conferences, special visitors, etc. Send "fire and forget"-messages to employees / departments for general information, such as changes of lunch times or opening hours, maintenance, events, etc. DAKS calls every individual user and user group authorized through a 'Whitelist' with special features that enable e.g. "forced release". Every user who is not authorized in this 'whitelist' is called normally, i.e. without the application of such special features. Ensures that DAKS-Pro normally plays back to every caller (of a hotline) an announcement before the call is thru-connected (e.g. 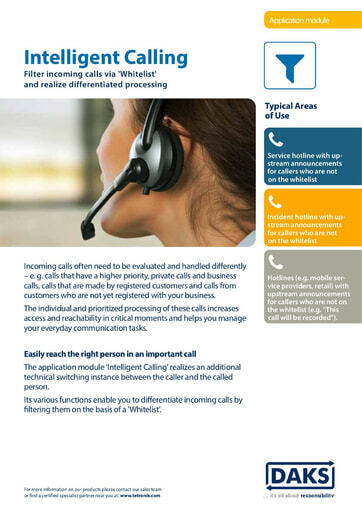 the legally required info message indicating that the call will be recorded), and only skip this announcement for callers or customers and clients who are part of the whitelist and with whom the hotline provider has expressly agreed to omit this message. Same as Function 2, but here the info message is - where applicable - suppressed for the persons that are called by the hotline, and not for those who call the hotline. Service hotline with upstream filtering: All callers who are not part of the whitelist receive a voice message before their call is thru-connected. Incident hotline with upstream filtering: All callers who are not part of the whitelist get an info message before their call is thru-connected. Hotlines (e.g. mobile service providers, retail) with upstream filtering: All callers who are not part of the whitelist get an info message before their call is thru-connected (e.g. "This call will be recorded"). In addition to link-up to the telephone or convergent voice/data network, DAKS-Pro also supports the link-up to a VoIP-based subsystem (e.g. to modern call systems in hospitals), and of up to 1000 directly connected SIP-based microphone units, PA couplers or SIP phones on the secondary connection side. Terminals on the secondary connection side can be worked into the DAKS-Pro alarm processes (Broadcasts/Conferences), and can also activate these alarm processes. 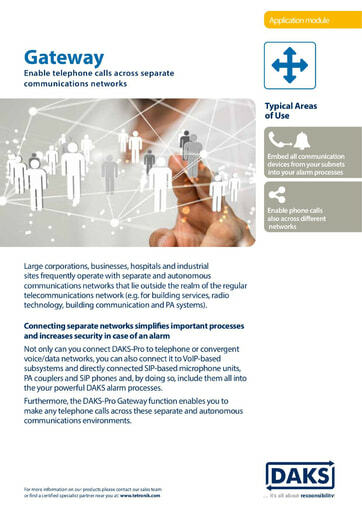 What is more, DAKS-Pro also serves as Gateway and with this function enables all calls between the subscribers of the PBX network to the secondary connection side, and vice versa.